Quotes make us feel a range of emotions. What is one of the best quotes you’ve heard? Did you make up your own favorite quote? Tell us…Anything goes! *This contest will be open until Friday May 20, 2016 at 3 PM EST. 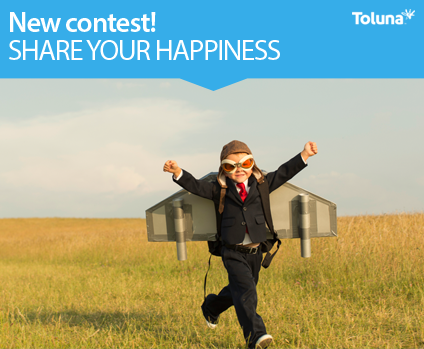 Share what makes you happy with Toluna, and win up to 10,000 points! We have a very special announcement! One Toluna employee from our Timișoara, Romania office is doing a 10-week long bicycle ride through Romania, Bulgaria, Turkey, Georgia, Armenia, and Iran. While on his ride, people will be able to purchase days and donate money to Silviu’s ride that will all benefit charity. If you would like to follow Silviu’s journey, check out his trip’s Facebook page here. In honor of Silviu’s long voyage ahead and charity, we are hosting a very special contest in which you could win up to 10,000 points! Simply share what makes you happy, in one sentence! Here’s how you can participate on Toluna.com, Facebook, Instagram, or Twitter from April 13 – April 27. Participate in our Topic contest here, and tell us what makes you happy – in one sentence! All members who participate will receive 100 points, and 3 members will win 1,000 points each! Like our Facebook page “Toluna” and tell us on our post here what makes you happy – in one sentence! 3 lucky winners will win 5,000 points each! One winner from Twitter, and one winner from Instagram will win 10,000 points each! We would like to thank everyone who participating in our August Theme contest. Many of you posted on our wall and emailed us saying how much you enjoyed the contest.